In a race against time, Greg Hettinger has to find The Connection and take down his drug empire before his identity is revealed to the public as The Black Hood. In the conclusion of 'The Bullet's Kiss,' Duane Swierczynski, Michael Gaydos and Kelly Fitzpatrick finish up the first arc with the same gritty action and grainy visuals that have made The Black Hood a must-read. 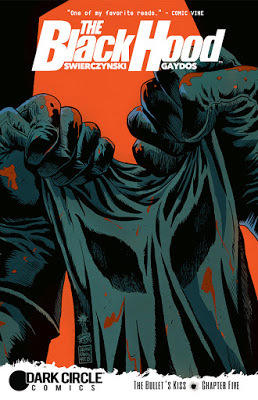 The Black Hood has been a compelling character study in vigilantism and addiction. Hettinger is one of the most complicated characters in comics who isn't easily defined. Sure, calling him a junkie cop with a penchant for wearing a mask and kicking criminal's asses at night would be fairly accurate but doesn't tell the whole story. Since the beginning of the series, Hettinger has provided the on-going exposition going on in his head and we've been privy to his mindset. He's very self-aware, but he's still a slave to his desires, to the next high, whether it's from breaking some thug's jaw or from drugs. It's this selfish pursuit that drives the action in this first arc. And it's what gets him in deeper and deeper in trouble. Not to mention stealing the drugs from The Connection's distributors makes him a target. The only place where the story falters a bit is in describing the criminal drug empire that only lurks in the shadows and during brief ominous meetings. There's a coordinated system of corruption that's a little too vague and perhaps it's purposely done to hide the reveal at the end. The result undermines the climactic impact of the final confrontation. Still, The Black Hood represents the same sort of deconstruction of the street hero that the Netflix version of Daredevil did. A man without powers, I realize Matt Murdock's heightened senses but it was downplayed, on a mission with incredible determination and resiliency. Despite the demons, Hettinger attempts to straighten himself out giving him a sense of humanity, flaws and all, that you don't see enough of in other comics. The artistry of Michael Gaydos and Kelly Fitzpatrick has given the series the raw and unblemished facade of a Philadelphia that is in decline. A city seen through the grainy filter of an artist willing to reveal not only the ugly scars of its protagonist but that of his hometown. An artist whose lines travel a scraggly path unable to find the straight and narrow much like the characters on the page. Fitzpatrick tries to lighten the darkness with variegated color but is continually drawn to the shadows that envelope scenes with noirish flair. The Black Hood is the best of pulp fiction where heroism is a gray area as muddled and dark as the hearts of the villains. Hettinger walks a thin line of moral ambiguity but tries to redeem himself even if it is to save his own behind. Will he find redemption? Can he expose the corruption within the department and save himself in the process? Duane Swierczynski has crafted another compelling crime drama that will leave you riveted.